Sir Mekere Morauta, Kt, from Gulf Province, was the second Governor and served from July 31st, 1993 to September 15th, 1994. He holds a Bachelor’s degree in Economics from the University of Papua New Guinea. He was the first Secretary for the Department of Finance when PNG gained independence in 1975 and helped established the fiscal framework and macroeconomic policies of the new country. He also served as managing director of the State-owned commercial bank, the Papua New Guinea Banking Corporation (PNGBC) from 1983 to 1992. 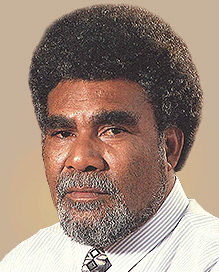 After his term as Governor, Sir Mekere continued as a successful businessman before entering national politics, becoming the sixth Prime Minister of Papua New Guinea from 1999 to 2002.